That booming John Williams opening note, the iconic logo and an opening crawl that convincingly promises high adventure. Then it's off: colossal spaceships eclipse a planet, on whose surface we find Max von Sydow and Oscar Isaac under assault from the forces of a retooled Empire. It's immediately recognisable as that good ol' grubby-as-hell Star Wars universe. And it's like we've never left. The duff prequels are already forgotten a couple of minutes in, and it feels like J.J. Abrams has achieved the impossible: a successful relaunched of Star Wars, With the nervous anticipation with which you watch a high-wire act without a safety net, we're introduced to a new generation of Star Wars heroes and villains and, even more tantalisingly, reunited with our old friends Han, Leia, Chewie and the rest. We explore exciting new worlds populated by reassuringly rubbery aliens. We learn of galaxy spanning threats, mystical mysteries and are teased by prophetic hints. It's all good. Then, sometime around the middle of the film, it curdles. What initially felt like understanding gradually shifts towards shameless aping. By the time The Force Awakens rolls credits it's proved Aesop right: "familiarity breeds contempt". It's not as if The Force Awakens is a bad movie. I'm no die hard fan of the series, but even I feel a giddy thrill at watching the Millennium Falcon dive and wheel through the shattered corpse of a Star Destroyer. The simple synthesised hum of a lightsaber presses my buttons, as does the screaming blare of a passing TIE fighter, or the friendly beep-boop-beep of droids old and new. I'm also impressed by Abram's subtle metanarrative. New protagonist Rey opens the film inhabiting the broken remains of the franchise, subsisting by selling off tiny fragments of the previous films to unscrupulous buyers. She's surviving on our childhood dreams, both her fictional existence and The Force Awaken's success dependent on how effectively they can mine the past. Similarly fun is the eventual appearance of amusingly named master villain 'Supreme Leader Snoke' (Andy Serkis). Abrams is too classy to take overt jabs at Lucas, but having the villains in thrall to a gigantic CGI projection is a well pitched wink, contrasting Lucas' 'evil' digital poison with Abram's heroic latex n' rubber puppets and makeup. 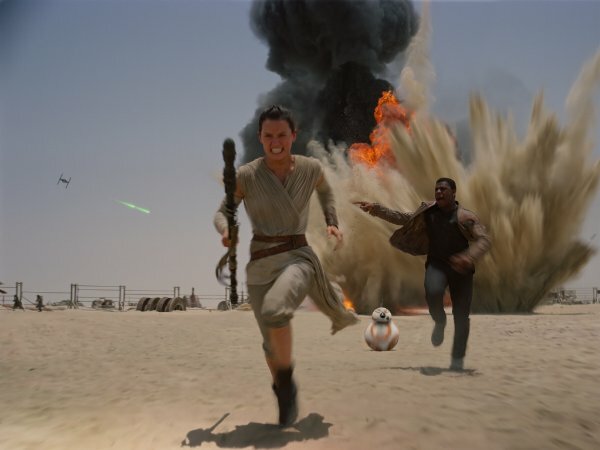 But, despite all that loveliness, The Force Awakens underwhelms. Firstly, it becomes apparent at the halfway mark that The Force Awakens is a loose remake of A New Hope. We start in the desert with a lost droid that's found by a wistful teenager. She proceeds to be sucked into an intergalactic war where she learns the power of the force and helps destroy a planet-sized doomsday device. Along the way we visit a space bar inhabited by all varieties of bug-eyed alien, escape an Imperial base and witness a planet being destroyed. A slavish repetition of the series' greatest hits is a bit unambitious: what initially appeared to be a bold continuation of styles and themes becomes wheel-spinning. Worst of all, it fails to live up to A New Hope. Among many other deficits, Rey's transformation from naive peasant to brave warrior isn't a patch on Luke Skywalker's hero's journey, the make-up of this post-Return of the Jedi universe is never explained and a planet destroying superweapon that eclipses the Death Star is introduced and destroyed with a narrative shrug. Secondly, the film falls prey to Marvel-esque franchise-itus. The Force Awakens is designed to usher in a profitable new era for the franchise with, god help us, one new instalment each year. As such, the film is crammed with narrative strands that I assume will be addressed years from now in Rian Johnson and Colin Trevorrow's sequels. Granted you expect all that, but still, it lessens the emotional heft of the climax. 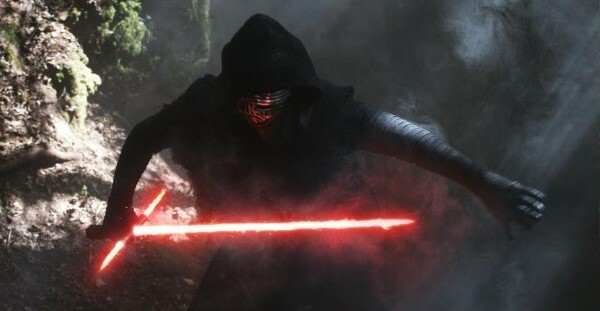 For example, powering much of the plot is that Adam Driver's Kylo Ren is extremely upset at Han, Luke and Leia. This anger has driven the Ren to the dark side, resulted in the disappearance of Luke Skywalker and provides the bedrock for key events in this film's climax. Problem is - we've got no idea what he's so goddamn miffed about! This deflates tension from what should be heart-pounding scenes. I assume we'll eventually find out sometime in 2019 or so why he's angry, at which point these scenes might have an ounce of pathos. Until then, the back-end of the film just doesn't work. It doesn't take much thought to understand why The Force Awakens is riddled with these deficiencies. Disney paid $4 billion for Star Wars with the intention of launching a cinematic universe with no apparent end. The inaugural film thus functions primarily as a prologue, establishing tone, cinematic style, introducing characters and, most importantly for Disney, encouraging the audience to return for whatever they dish up next. To Abrams credit it does all that. Unfortunately it means The Force Awakens isn't much of a film in its own right - if you were feeling particularly uncharitable you could dub it a feature-length teaser for the myriad pleasures Disney are yet to release. What's left is an nakedly commercial product uplifting by a smattering of artistry and a heavy nostalgia kick. A mild, yet painful, disappointment.